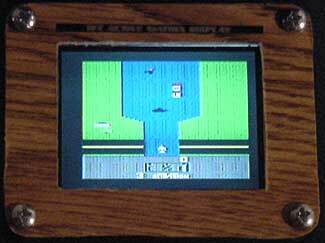 Comments: The 2600 makes a spectacular comeback in this portable version. It is a fascinating combination of original, handcrafted art and videogame technology. The first of its kind! Look at the nice job Ben did on the design: wood grain around the screen; aluminum strip with classic atari style rainbow line; autographed sticker with version and serial number; 2600 joystick outputs; and link ports! Warlords anyone? 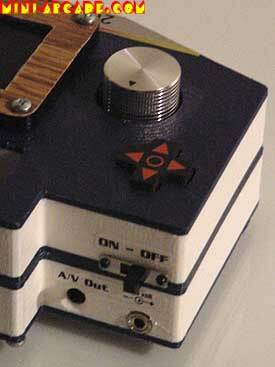 He also did a nice job on the casing - custom routed plastics for the body and some of the controls. 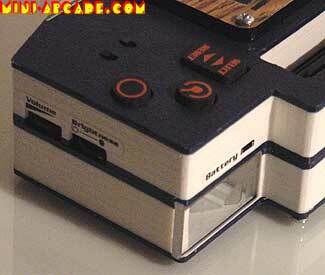 Here you can see a joystick controller, a very nice quality paddle controller, A/V output, and power input. 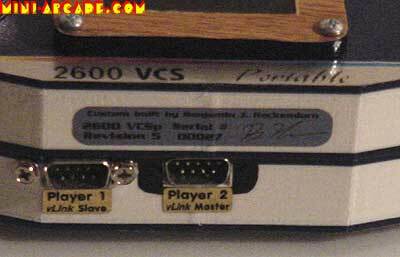 Since this has joystick ports and the A/V port, you could also use this portable as a regular 2600 hooked up to a TV set! More fabulous designs: volume and brightness dials; lithium battery compartment with cover; select and reset buttons; joystick fire button, paddle controller button, and 2 difficulty A/B switches. I must say, very nice response with all the controls. 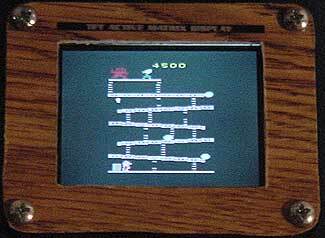 The world's smallest 2600 Donkey Kong. Yet every single pixel is quite clear and visible. Here are some pics from CGE-2K1, which are particularly special to me since these famous gaming pioneers are playing MY atari VCSp (serial# 27)! Thanks guys, for making these games and machines that I grew up playing. 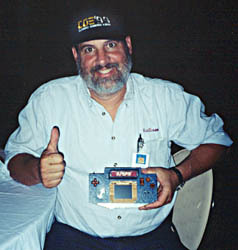 Joe Decuir - one of the original designers of the Atari 2600 hardware. He also programmed Combat and Video Olympics. 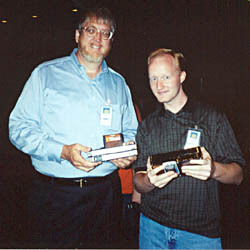 David Crane - programmer and founder of Activision (THE FIRST third-party software company in history). He programmed on classics like Pitfall I and II, Decathlon, Fishing Derby, Freeway, Laser Blast, Kaboom, Grand Prix, and many others. 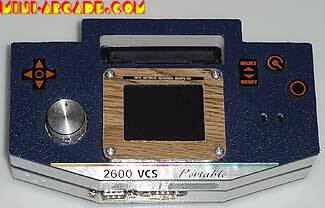 On the right is Ben, the mad-scientist behind this 2600 VCSp portable. View my links page to find Ben's site and learn more about his video gaming laboratory experiments. 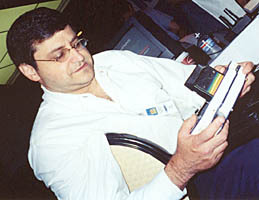 Rob Fulop - an early Atari programmer who made an exodus to Imagic. He programmed on classics like Demon Attack, Missile Command, Night Driver, and Cosmic Ark.